Flowerdew; Billingsford, Moreuil and Framlingham. Gordon Muriel Flowerdew was born near Scole in South Norfolk on January 2nd 1885, the son of Arthur and Hannah Flowerdew of Billingford Hall. One of ten sons and four daughters, he, like all his brothers, was sent to Framlingahm College which he attended from 1894 to 1899. The 1901 census shows him living with one of his older brothers as a lodger in a house in Hackney. Two years later, aged 17, he emigrated to Canada where he took work where he could find it. Flowerdew arrived in England with Lord Strathcona’s Horse in early 1915 and embarked for France in May. After the German army had been held at the first battle of the Marne in September 1914 the western front settled into three and a half years of relatively static trench warfare. During this time Lord Strathcona’s Horse, by now part of the Canadian Cavalry Brigade commanded by General Seely, operated as infantry. Had the Somme offensive of July 1916 been successful Flowerdew’s brigade would have followed up the breakthrough and cleared through the German lines. Flowerdew was commissioned Lieutenant in 1916 and in January 1918 was given command of C Squadron of Lord Strathcona’s Horse. On March 21st 1918 the German Army launched its Spring offensive, designed to break through and destroy the British Third and Fifth Armies and take Amiens. It nearly succeeded. So far, so true, and then the fog begins to descend. The battle for Moreuil Wood was a confusing and bloody affair. German infantry, well supplied with machine guns and trench mortars and supported by artillery held the wood against the Canadian cavalry supported in its turn by British artillery and the Royal Flying Corps. This much we know, that the German army occupied Moreuil Wood on March 30th 1918, that General Seely and the Canadian Cavalry Brigade were ordered to advance on Moreuil Wood and counter attack the Germans, that C Squadron did charge the Germans with drawn swords and that Flowerdew and most of his squadron were killed or wounded. “For most conspicuous bravery and dash (NE of Bois de Moreuil, France) when in command of a squadron detailed for special service of a very important nature. On reaching the first objective, Lieutenant Flowerdew saw two lines of the enemy, each about sixty strong, with machine guns in the centre and flanks, one line being about two hundred yards behind the other. Realising the critical nature of the operation and how much depended upon it, Lieutenant Flowerdew ordered a troop under Lieutenant Harvey VC, to dismount and carry out a special movement while he led the remaining three troops to the charge. The squadron (less one troop) passed over both lines, killing many of the enemy with the sword, and wheeling about galloped at them again. Although the squadron had then lost about 70 per cent of its numbers, killed and wounded, from rifle and machine gun fire directed on it from the front and both flanks, the enemy broke and retired. Most contemporary and post war accounts of Flowerdew’s charge seem to use this as a source document, with greater or lesser degrees of embellishment. Typical of the time too is a letter written to Flowerdew’s mother by his commanding office, Lt Col D J Macdonald. Published in the Diss Express of 29th November 1918, the letter is obviously written to try and give comfort to a grieving mother and cast her son’s death in as good a light as possible. The victory was short lived. The Germans retook Moreuil Wood again the next day and again the Canadians had to counterattack and take it back. A few days later the Germans again retook the wood and were only finally dislodged by French troops during the Hundred Days offensive in August 1918. Seely had two choices: he could portray the action as a glorious passage of arms, a full cavalry charge with drawn swords, or he could brush it under the carpet as a disastrous action best forgotten as soon as possible. Had Flowerdew survived it has been suggested that he could have had him court martialled for recklessly endangering the lives of his men. 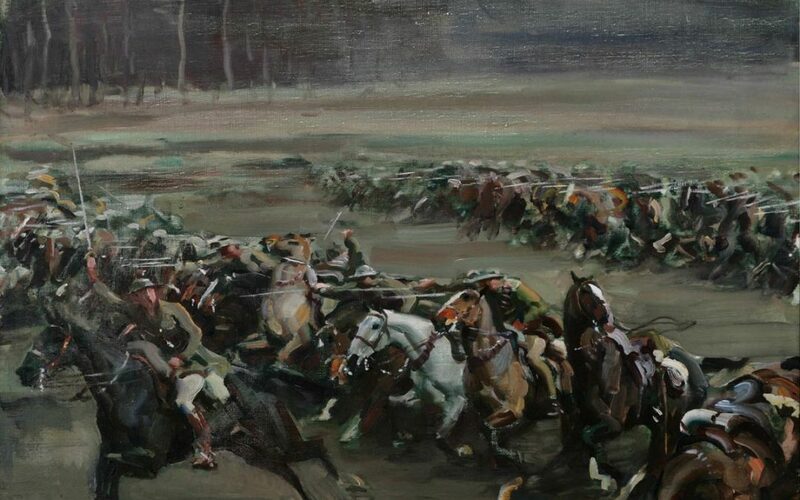 No mean publicist, Seely took the former course, prepared the citation for Flowerdew’s VC and slightly later retained the services of Alfred Munnings, already his unofficial war artist, to paint a picture of the battle of Moreuil Wood, which became “The Charge of Flowerdew’s Squadron”, painted from memory a few months later and highly idealised. 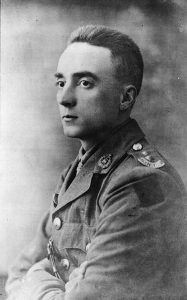 Gordon Flowerdew was promoted Captain in the field by General Seely and died of his wounds at 41 Casualty Clearing Station on March 31st 1918, Easter Day. He is buried in plot IH1 in Namps au Val British Cemetery near Amiens. His VC, a copy of his citation and his temporary grave marker or battlefield cross are held in Framlingham College chapel. Thanks to Framlingham College for allowing access to the chapel and to records about Flowerdew in the college library. Blog post originally appeared on Hidden Commemoration.